The assembly went ok so then I headed on to install Mythbuntu (which I had decided to try first) from an external USB DVD drive. Installation of Mythbuntu was incredibly straight forward and as I had decided this was to be a quick test install I just gave the whole 1TB drive over to it and it created one big root filesystem. My plan is to reinstall later and create at least two filesystems, one root and one for recording data. [ 8.940190] saa7146: register extension 'budget_av'. [ 8.940326] saa7146: saa7146_init_one(): request_irq() failed. Notes: Dual Risers only work with certain chipsets and motherboards. These Dual Risers are designed for boards with VIA C3 / C7 chipsets (i.e. most EPIA / Jetway boards), and with Intel Atom motherboards. To use with an Intel Atom board: put the IRQ jumper on the lower row, 3rd pair from the left. Untested / not compatible with other socket based Intel / AMD motherboards. We cannot guarantee compatibility with dual risers and all products. [ 9.813798] saa7146: register extension 'budget_av'. [ 9.814957] saa7146: found saa7146 @ mem f9b58c00 (revision 1, irq 18) (0x1894,0x0022). [ 10.505476] budget-av: ci interface initialised. Mythbuntu then gave some feedback straight away when I choose the DVB-C tuner card and it would search for channels. The PCI riser did have a very long jumper on it. I tried all the different jumper settings, one of them gave a slightly different result in dmesg but there were a lot of timeout messages for the saa7146 device. 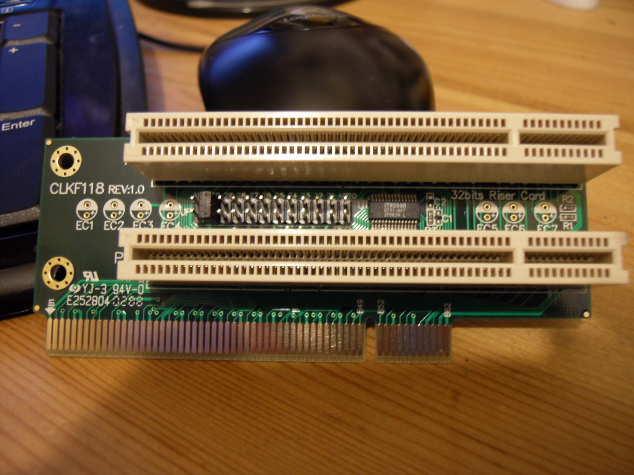 I gave up trying to get the two slot PCI riser to work as I don’t need the option of two slots and have ordered a PCI riser ribbon cable from ebay which I hope will solve my problems. Today I wanted to increase the speed of my pox device in the hope of upping the density of my flange. My original plan was to warp the pituitary levels by suppressing the output mass on the turkey neck indicator thus reducing feedback wobble but I only succeeded in exacerbating flatulence memory. Snap, crackle and pop were ineffectual, as was igglepiggle, which resulted in two separate file systems, one for rooting and the other for tooting. With all of your experience in these areas I wondered whether you might have an alternative suggestion? Thanks for this post, I had exactly the same issue. Removed the riser and everything works. Mine is a little bit different, I do have the jumpers too.